My only exposure to architecture tends to be the occasional profile in the New Yorker. 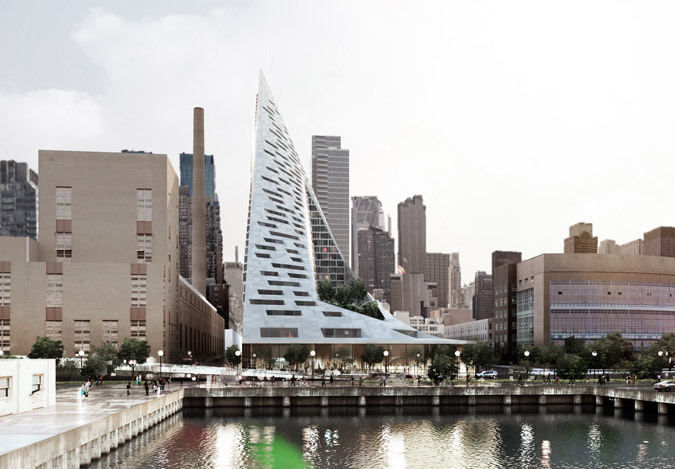 So it was with their recent profile of Bjarke Ingels. I was struck by an image in the magazine of Ingels' proposed condo complex on West 57th St. in New York City, in Hell's Kitchen. Here's another computer rendering which was published by New York Magazine. The curvature of the building is designed to provide maximum sunlight to as many of the apartments as possible. I'm not sure the neighborhood will approve a structure like that dropping in on the neighborhood, but that is gorgeous to my eye, like something straight out of Blade Runner.